Oh, and did I mention that I’ve never done back-to-back 50s before? NATRC and LDs, yes. 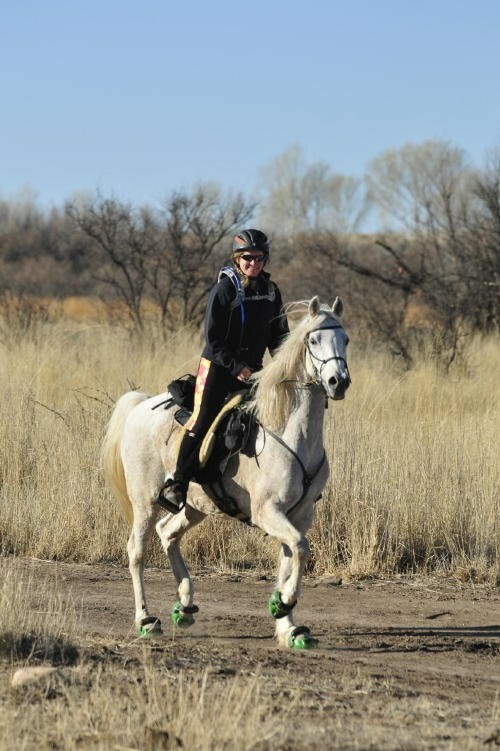 But prior to retiring the pony, I still hadn’t gotten to the point where I was able to view a 50 as “easy” or “just another ride” and the idea of doing two back-to-back made my muscles whimper. And I had a blast. I “get” the appeal of multi-days now. There’s something to be said for one drive, one camp set-up, but multiple rides. It seemed a little less rushed, less hurried. 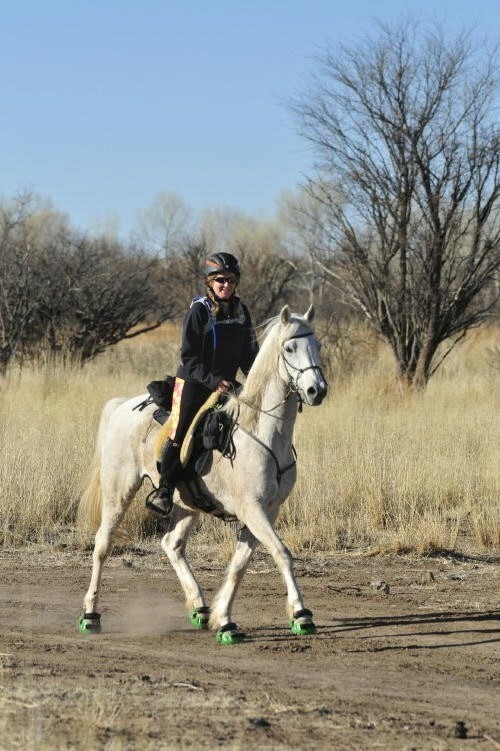 And getting the chance to ride with endurance riders who have years and thousands of miles of experience on me is a fantastic learning experience. Sooo…I haven’t done one of these [ride stories] for a while. One thing I don’t have is photos…the first day, I was riding a (somewhat) green horse on his first 50, so juggling him + camera wasn’t on the agenda. And on the second day, I was on an enthusiastically forward mount, so needed both hands on the reins for him. He’s a very photogenic horse. It had been over 6 years since I had been down to Sonoita, but aside from some freeway-expansion construction around Tucson, it didn’t look like a whole lot had changed. The same golden, rolling grasslands surrounded by beautiful mountains. And there were still patches of unmelted snow decorating the perpetually shady parts of some of the hillsides. After unloading the horses — Rocco, Steph’s seasoned campaigner Hadji, and her new mare Kasha, brought along for the weekend for the camping experience — and registering and vetting in, we still had time to take the boys out for a quick pre-ride before ride meeting. Saturday’s ride would be pretty straightforward: four loops, with a 45-minute hold at the end of loops one and three, and a pulse-down/trot-by at the end of loop two. While I’m not world’s biggest fan of multiple loops in and out of camp, the part of my brain that kept reminding me of just how long it had been since I’d done a 50 was somewhat pleased: If I had to make tack adjustments, et cetera, it would be much easier to do in camp. Also, the “small bites” effect. Just concentrate on getting through each loop. Plus, you don’t have to pack vet check bags for when you’re in camp, or figure out exactly what food will appeal at that point. And it’s easier to shed/add clothes. For whatever reason, it seemed like everything came together really fast, at least compared to what I remember, to the point where I was in bed by 9:00, even after Steph and I watched an episode of ‘Grey’s Anatomy’ on her portable DVD player. I slept like a log (most comfortable mattress in the world resides in the gooseneck of Steph’s trailer) and was actually up about 2 minutes before my alarm went off at 5 the next morning. One thing that hasn’t changed: I still hate to eat breakfast early in the morning. I managed an unfrosted blueberry poptart, a couple slices of cheese, and half a yogurt. Kind of pathetic…but I forgot the peanut butter and undercooked the hard-boiled eggs. He managed to scrape a chunk of hide and hair off his right hind leg, just above the fetlock…and another chunk on his left hind just above the coronet band. He was walking sound and wasn’t too terribly concerned when we poked at the areas…so I saddled up. We did do a quick trot-by for the vet, but he didn’t notice anything amiss, so off we went. We started out toward the back of the pack, worked our way up towards the middle, and pretty much stayed there the rest of the day. Rocco did a spectacular near-face-plant less than a mile out of camp when he moved off the trail to dodge a tangle of branches…and tripped over the hidden log. On a downhill. That was fun. But he kept it together really well, didn’t freak out…and learned his lesson about over-zealous dodging around branches. I really had to keep reminding myself it was his first 50. He is just so solid. He didn’t get overly concerned when horses would pop up behind us, he didn’t really care about being passed, and would pass others politely. He is kind of an Energizer Bunny in that he likes to keep moving, and doesn’t quite get the concept of standing quietly under saddle (yet)…so waiting for the multitudes of gates on this ride to be opened/closed was a good lesson in patience for him. Still working on getting the drinking thing down…he passed up more opportunities to drink than I was happy with…but one hot ride will teach him. Back to camp after the first loop, he was pulsed down by the time we reached the P&R area, and he vetted through with all As…except for needing work on the trot-out. To be fair to him…I don’t know if he’d really been trotted out much in-hand prior to this weekend. sooo…handler-fail on my part…but we figured out that if Steph trotted Hadji out at the same time, Rocco would follow Hadji…so we got our decent trot-outs that way. Oh, well…work on that before the next ride. The second loop included some really pretty sections of service road that wound through stands of old oak trees, and another eally fun section of single track that traversed along the valley floor between two ridgelines. Prior to this ride, Rocco gave off the impression of being a “good little worker bee.” Not spectacular, not particularly fast…but pretty consistent and would get the job done. Probably a good multi-day horse, but probably not one to top ten. All I can say is, “Sandbagger.” At the ride, he offered up a previously-unknown big power trot that easily clocked 12mph on the GPS (we didn’t canter a single step the whole day and the max speed hit 14mph). But the beautiful thing about him was even in that power trot, he naturally rated. Maybe it’s lack of experience and exposure, but he wasn’t inclined to be “racy” and didn’t pull on me at all. Back into camp for the pulse down and trot-by, then we were out again before my brain had a chance to register the thought of “break.” Loop three was short…go out the same way as loop one, but cut off about halfway through then rejoin with the last third or so of loop one. Loop three also included a water crossing, something Rocco “hasn’t done a lot of so might not be wild about.” So proud of him when he marched through the mud, into the stream, and back through the mud on the other side. Would have liked for him to stop and drink…but again, a case of him wanting to “get on with it.” And we were only a few miles out from a water trough. A hot lunch during this check tasted fabulous: brats and burgers provided by ride management. I’d done really well during the first check with raiding the cooler and doing my best hoover impression (past 8 in the morning, I can cheerfully eat a wide variety of food), so felt really good and fueled up for the second loop…but the pulse-n-go check after loop two didn’t leave time to refueling, so I’d relied on an energy gel and squeeze-applesauce out on the trail. And now I was hungry again. But I was mostly amazed at how good I was feeling. I’d taken one Motrin after loop one, and wasn’t feeling the need to take another one yet. There’s really something to being on a horse who doesn’t beat you up and is a consistent ride with soft gaits, and doesn’t pull or necessitate a lot of bracing in the saddle. Loop four was a short loop, out the same way as loop two. As we headed out, I could practically see Hadji rolling his eyes and giving of a very clear, “This again?” attitude. But Rocco, bless his naive little heart, practically bounded out of camp. As I said before, Energizer Bunny who just loves to go, so the notion that we kept going back out again was thrilling his little soul. He was so thrilled, in fact, he actually took over leading for part of the last loop! He hadn’t shown a lot of previous inclination towards wanting to lead or being particularly brave out front…but the fact we were now on a trail he’d already seen was a huge confidence boost for him, and he cheerfully headed out front and gave me a nice working trot. We pretty much motored through the last loop — which was basically the first and last part of loop two. And with that finish, Rocco earned me my first endurance mileage patch for 250 miles! And I felt great at the finish! Muscles that had been used, but not abused. A little tired, but exhilarated. Lots of happy adrenaline from a successful finish and a ride that did a lot towards chasing the ride-demons that have been plaguing me for the last couple of years away. Blogger wouldn't let me finish the rest of my previous comment. Anyways, after riding stashing my ride and tie partners horse who is soft gaited, I wonder if me and Farley would finish rides feeling less best and bounced if it was so. It was a novel concept. I've ridden 9 different horses to date in distance stuff, and the vast majority of them, my dear pony included, have been quite a bit of work to ride…either over-eager, or really strong, or spooky, or rough/choppy. We shall see what happens with Rocco over the next few rides, if he “wakes up” and becomes more of a handful or not…but even if he does, it won't change the fact he's an “easy” mover who doesn't land hard (seemed like he barely scuffed his boots) and is naturally balanced and collected. Eh, 50/50 shot. Half the ones I've ridden have been grey and some have been better than others. Aaahh so fun! Very awesome about one Motrin powering you through. I worry about aches/pains as I pursue my first 50s this year. We'll see. One does of Aleve mid-morning got me through 13 hour ski patrol days…maybe it'll do the same for a ride…. Hmmm. A 14 mph trot?! I can only imagine how huge his stride must be! I went for one more Motrin before I went to bed, then ended up doing Aleve on day two. I don't think he sustained the 14mph for very long…his comfortable big trot seems to be around 12mph. When he does stretch out, he's got a nice extended trot and good stride.